TAMPA, FL--(Marketwired - June 09, 2016) - College H.U.N.K.S. 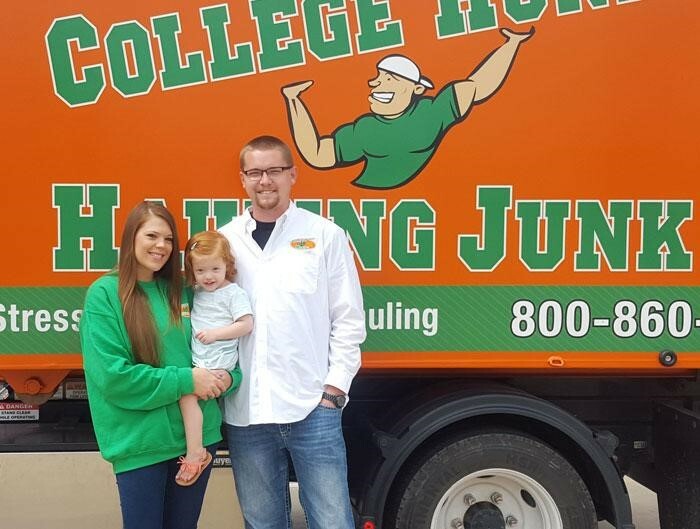 Hauling Junk and Moving saw average franchisee revenue skyrocket 51% from 2014 to 2015, according to the company's recently filed Franchise Disclosure Document. Among 30 franchisees who reported sales figures for all weeks in 2015, average gross revenues in 2015 were $730,553 -- up from about $482,000 the year before. For franchisees who offered both junk hauling and moving services to customers, revenue was $824,555 in 2015. "Our success proves that you can take a business as simple and old-school as junk hauling and moving and turn it into an amazing opportunity by providing franchise support, building a great culture and building a great brand," CEO and co-founder Omar Soliman said. "When (co-founder) Nick (Friedman) and I started this business, we envisioned helping people nationwide duplicate the success we've had in Washington, D.C., and Tampa, and that vision is becoming a reality." College H.U.N.K.S. sales growth is powered by happy franchisees. The company was recently named to Franchise Business Review's Top 50 list of franchise companies with excellent franchisee satisfaction ratings, which is the result of a survey of more than 26,000 franchisees representing hundreds of brands. Franchisees benefit from a strong, attention-grabbing brand. College H.U.N.K.S. has been featured on The Oprah Winfrey Show, ABC's Shark Tank, CNBC's Blue Collar Millionaire, HGTV's House Hunters, AMC's The Pitch, Bravo's The Millionaire Matchmaker, TLC's Hoarding: Buried Alive and Fox Business, as well as in The Wall Street Journal, The New York Times, USA Today, The Huffington Post, Forbes, Inc. and more. The publicity has made College H.U.N.K.S. a familiar brand, even in areas we don't yet serve. Our bright orange and green trucks and catchy name attract attention from potential customers wherever we go. "It's a brand that, just by going out and being in public, generates a lot of excitement," said Steve Arvoy, who opened his College H.U.N.K.S. Hauling Junk and Moving business in Northwestern Virginia in March. "This big bright orange truck with the name 'College H.U.N.K.S.' gets a lot of attention. People are like, 'Hey, we like the name. That's awesome!' I had a lady at a gas station walk right up, and that happens often. They come to you! They ask questions. They're intrigued and interested, and they ask what we do." Franchisees also benefit from a company culture that emphasized teamwork, building leaders, and fostering entrepreneurship among franchisees' employees. Employees join College H.U.N.K.S. to learn how to run a business -- not just for a job lugging furniture and other items. Franchisees mentor employees and impart valuable business skills and knowledge about best practices for customer service, marketing, scheduling and management. College H.U.N.K.S. growth has also been powered by a simple ROI equation -- franchisees continue to see strong revenue growth, and startup costs are extremely reasonable. To learn more, visit www.collegehunksfranchise.com. Amber Bush and Corey Gaither recently opened a College H.U.N.K.S. Hauling Junk and Moving franchise in Mansfield, Texas.